The C & O Canal is a National Park under the control of the Federal Park Service. 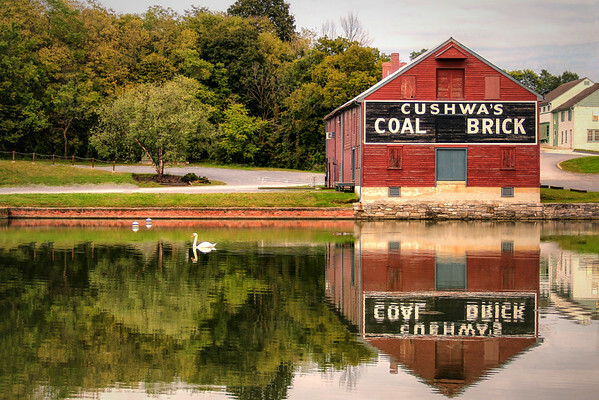 The Cushwa Basin, Trolley Barn, Lock 44, Lock House, and Aqueduct located in Williamsport in close proximity to each other allow visitors to witness first hand one of the most famous channels of commerce in the United States. Visitors can visit all of these sites by taking an enjoyable walk on the towpath along the C & O Canal which looks much like it did in the 19th century during its heyday. The Cushwa Basin is also a great point of entry for hiking, biking, horseback riding, and fishing. Built in the 1830s the Cushwa Basin was developed as a major point on the canal for the loading/unloading and turning of barges. The area around the visitors and the canal itself is steeped in history.